The fun of making pizza at home is you can really experiment with the different toppings. Oh, did we score a winner with this one, not your typical pizza but one we would have again & again. 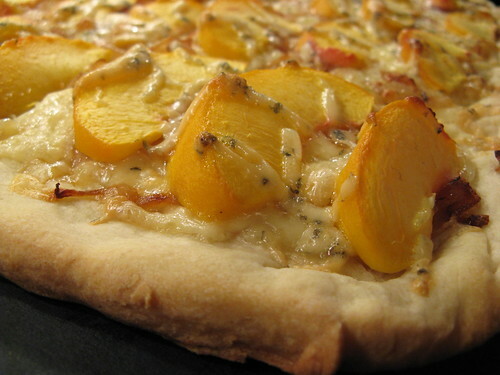 This pizza combination plays the sweetness of peaches & caramelized onions against the salty, sharpness of blue cheese. A base of Fontina adds a wonderful creaminess. I would say it is an adult taste, unless you have kids with sophisticated palates who enjoy blue cheese. It was perfect for dinner but I think it would make a lovely appetizer at a party cut into small pieces, especially with some good wine. I can also see other fruits working wonderfully on this such as pears or figs. Preheat oven to 450 F. Grease a baking sheet. Heat a non-stick skillet over medium-low heat. Add the onions & allow them to cook slowly until they are golden brown & quite tender, stirring from time to time. Bring a large pot of water to a boil. Add the peaches & allow them to boil for 1 - 2 minutes. Remove the peaches & use the tip of a sharp knife to remove their peels. Slice the peaches into 1/4 - 1/2 inch slices. Spread the pizza dough out on the baking sheet to your desired thickness. Brush a little olive oil over it. Sprinkle a layer of fontina & then a layer of caramelized onions on the dough. 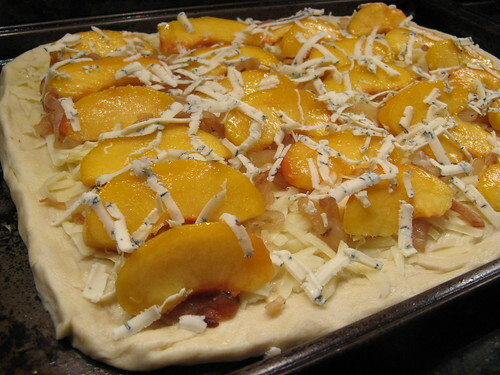 Arrange the peach slices in rows on top of the cheese & onions. Sprinkle the blue cheese all over the top. Bake for 15 - 20 minutes until the cheese is all melted & the crust is golden brown. Allow to sit a few minutes before slicing. Oh Kat... you just hit some of my favorite flavors. I would have never thought to pair the peaches with the blue cheese. My wife is going to love this. I may have to make this tonight! Wow, Nice picture and recipe. I will have to try this next time I have a pizza night! You are killing me!! I have been craving blue cheese, and this sounds like a match made in heaven! This looks do different and good. Using pears also sounds great. If only I could convince my husband that blue cheese won't kill him. Wow. 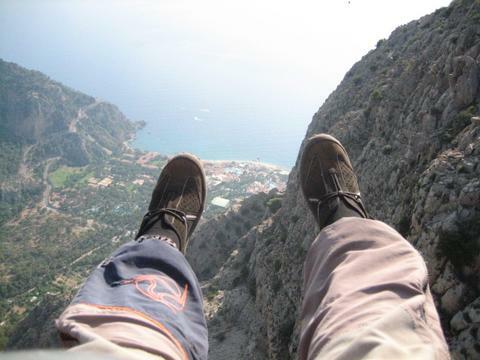 I would love to try that! With a little champagne cocktail you have got yourself a brilliant party nibble. Oh jeez, peach and blue cheese? Blue cheese would make the peaches uberdelicious! And on a pizza? This is hitting all my spots. That sounds amazing! What a wonderful combination of flavors. Soome grapes on their would be an idea too. No this is definitely not a kid pizza. But what a great appetizer for a party... with a nice glass of wine. (I am temporarily escaping my reality here). You've sold me on that pizza, it looks fabulous! Very interesting! I might have to try this. OMG this looks absolutely wonderful. I wonder what Grumpy would say if I made this? I wouldn't care if I had to eat the whole thing! Interesting. I'm having a hard time imagining what this would taste like. I can tell you you guys love blue cheese...I do too and for me any fruit with cheese is a good match!!! Incredible! That picture and YOUR recipe would be a wonderful addition to a post I'm doing for National Cheese Pizza Day (Sept.5th). Would you mind very much if I "grabbed" the picture to include in my post? I would of course link back to your Pizza Night post!!! AND..... GORGONZOLA and PINEAPPLE with aged balsamic vinegar. YUM YUM!! !